Our latest research shows that students who attend community colleges on the way to computer science (CS) bachelor’s degrees encounter many challenges and obstacles along the way. But there are many ways for community colleges and four-year colleges to work together and with industry to remove these obstacles and support students seeking to transfer into CS majors. Today, we are releasing two complementary research reports that explore the pathways that community college students follow to a bachelor’s degree in CS. The reports also examine the experiences of these students and the opportunities that exist or that might be created to ensure their successful career advancement. Longitudinal Analysis of Community College Pathways to Computer Science Bachelor’s Degrees investigates the national landscape of CS students at community colleges in order to better understand student behaviors and institutional characteristics that support or hinder community college students’ efforts to attain a CS bachelor’s degree. The companion report, Student Perspectives of Community College Pathways to Computer Science Bachelor’s Degrees, takes a complimentary in-depth and qualitative look at the experiences of students from underrepresented groups at community colleges in California, a state that enrolls one quarter of all community college students in the U.S. According to the Bureau of Labor Statistics by 2024 nearly 4.6 million high wage jobs will be in CS and related fields, yet there has not been enough graduates to meet demand. The shortage of CS bachelor’s degree earners is particularly severe among groups historically underrepresented in the field, where in 2013–2014, only 18% were awarded to women, 11% to Black students, and 9% to Hispanic students (National Center for Education Statistics). To address these gaps, the national spotlight has focused on the K-12 and university levels. But unfortunately community colleges are often overlooked in efforts to increase diversity for the CS field despite the fact that these institutions serve large numbers of traditionally underrepresented students--45% of all U.S. undergraduates are educated at community colleges, including 57% of Hispanic and 52% of Black undergraduates (American Association of Community Colleges). That’s a large and diverse population. Focused and fortunate from the start. Of the the nearly 1.8 million students who entered higher education for the first time through a community college in the 2007–2008 academic year, 235,388 of them earned a bachelor’s degree by August 2014. Among the bachelor’s degree earners, 3,290 earned a CS bachelor’s degree. The CS bachelor’s degree earners didn’t change schools as much as their peers; and, many grew up near tech hubs and in high socioeconomic neighborhoods where their community college had strong transfer supports and their four-year college had strong programs for CS transfers. Male and transferred before earning a community college degree or certificate. Only 12% were female, compared with 50% of other STEM and 56% of non-STEM transfer bachelor’s degree earners. CS bachelor’s degree earners were also less likely than their peers to earn a community college associate degree or certificate. Lack of clear pathways are a major hurdle. 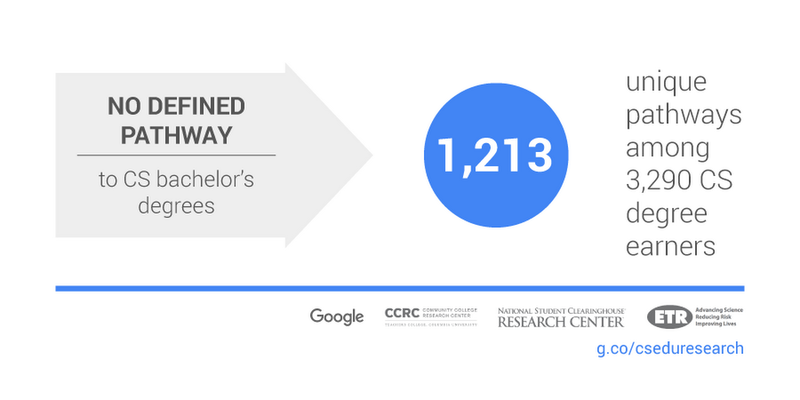 The 3,290 CS bachelor’s degree earners in our dataset followed 1,213 distinct paths to graduation, and with insufficient information on pathways and requirements, many struggled to efficiently move through the prerequisite chain of classes in preparation for transfer. Capacity constraints and strict requirements thwart progress. Limited capacity at both two- and four-year colleges, as well as strict requirements for CS majors that can’t be fulfilled at all community colleges limits progress for most students. Students have limited knowledge about the application of CS. Community college students often have limited knowledge of “real world” CS settings and careers in CS, but are encouraged by “real world” exposure through projects, internships, and role models. Develop program maps between two- and four-year colleges. Local two- and four-year institutions should work together to create CS-specific program maps with guidance on the courses that will transfer with guaranteed acceptance if requirements are met. Provide institutional support and flexibility for community college students. Community colleges should provide students with academic and financial supports while also working with industry to redesign their CS programs to minimize required courses while offering programs that shorten remediation time. Broaden knowledge of CS careers. Both community colleges and four-year colleges should proactively recruit students, especially female and minority transfer students, into CS by informing students of the salaries that can be earned, the number of job openings, and the variety of jobs that use CS skills. To reach the diverse pool of students that community colleges already serve, universities and industry must work with community colleges to ensure the needs of community college students are met. Today’s reports illuminate opportunities to support collaboration efforts to increase successful participation in CS for all students, no matter where they start.